When you lay a hardwood floor in your home, some of the first things that come to mind are color choices and the type of wood. The direction in which the flooring runs may not be a top consideration, but it is essential to plan this aspect carefully. Before going with a standard vertical pattern, consider the shape and size of your room. The direction you choose can impact the visual perception of the space inside the room. The direction in which the wood flooring runs can visually change the perception of the space. If you have a room that is narrower than it is long, it can end up feeling closed in. Laying hardwood flooring vertically in this situation would make the illusion even worse. To combat this problem, lay the flooring horizontally. This draws the eye from side to side, instead of down the length of the room. Just like a horizontally-striped shirt can make people look wider than they are, the horizontal stripes created by the floor boards have the same effect on a room. Vertical flooring is the most common orientation for wood floors. 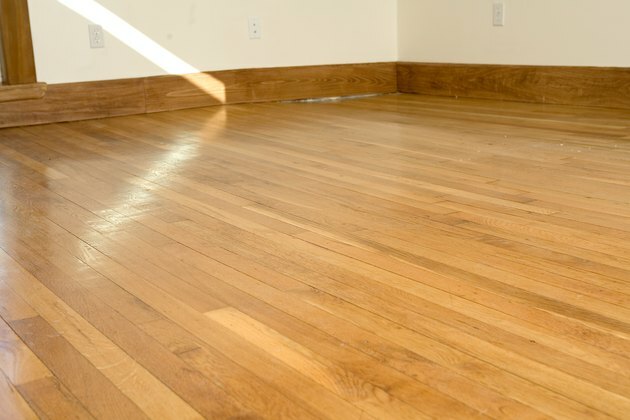 If the room is not overly small, floorboards that are placed vertically will work just fine. If the room is wider than it is long, laying the flooring on the vertical will help create the illusion of length in the room and balance it out. The only instance in which a vertical orientation should not be used is the instance above, when the width of the room is very narrow. Diagonal flooring adds visual interest to a floor and can make the space seem larger. The eye is drawn across the room, creating the illusion of greater width and length. This orientation works very well in tiny rooms where both length and width are an issue. Diagonal flooring can also be used simply to make a floor pattern more interesting or to create a conversation piece for the room. Creating wood patterns on the floor is a great way to change the entire look of the room, but they should be used with caution. Floor patterns that will not close in a space include parquet style and herringbone or chevron patterned floors. They draw the eye both vertically and horizontally, creating balance. Inlay patterns, while stunning, can close in a space and should only be used when the room is quite large. For example, a darker piece of trim wood can be run around the border of the room to give it dimension, but in a small room, this will close in the space.